It’s a good thing we seem to forget the miserable, dreary winter season once a bit of warmth moves in, because this past winter has been one of the worst winters I can remember in a long time. 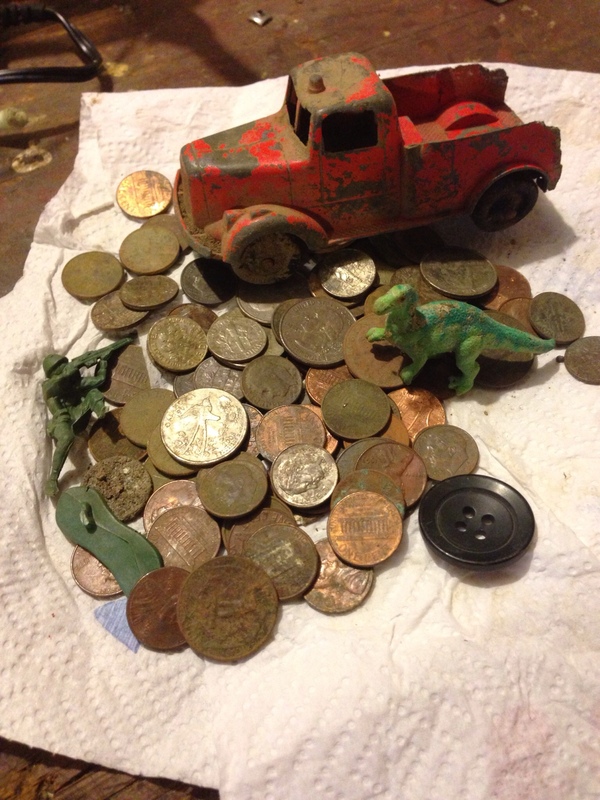 It was so cold outside that I was neglecting detecting. I didn’t forget about it–just neglected it. I mean, I thought about it frequently, looked at the thermometer, got annoyed, and went back to my computer. Occassionally I looked hopefully outside to see if the snow was melting (just in case I missed something), but no, each time I looked there was still 3 feet of frozen snow covering the ground. But something really cool happened last week–It got warmer. Amazing, I know. I’m sure you all felt it too. Mother Nature finally heard my prayers, and with this warmth, the snow finally did melt, and when I say warmth, I don’t mean blustery Spring temperatures. Although We did have one day when I think it hit 65 degrees, the warmth I’m speaking of was just above freezing; but then of course it dipped right back down to below freezing soon after. Kind of bizarre, and like the weather in Denver. With the snow finally melted, I got an immediate case of detecting fever, and have been out three times already this week. 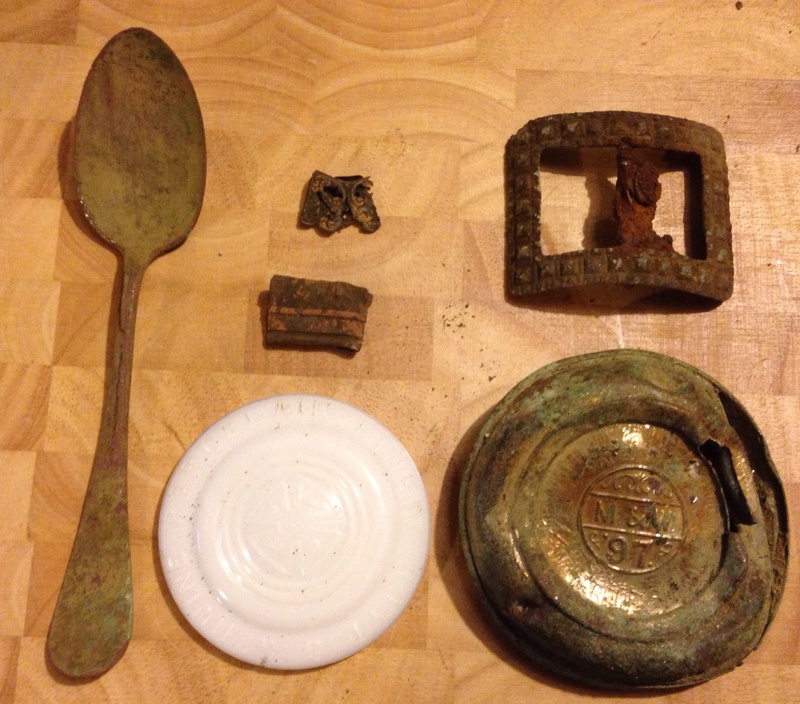 My first time out, I went to a local park, just to get back in the swing (pardon the pun), and where I knew I would find a lot of clad. Well, I did find the clad, but I also pulled a cute Tootsie Toy truck out of the mud, all four wheels intact, but sadly, the axels broken. My next two outings were at a huge open space area I had tried to hunt in the past, but it had been closed for bow hunting on my previous attempts. This time, however, it was free and clear of the bow hunting Bambi killers–I know, I know, you gotta trim the herd–disease, lack of food, etc… I love venison, and I’m just teasing about the Bambi killers, but I still have those flashbacks of dead deer hanging in the shed, and my job of washing the meat, making sure to pick any fur out of it. Yuck. Well, the Bambi haters must have done a good job with their bows, because oddly, I did not see a single deer while wandering, which is very unusual, but I did see a few evil tree stands. Yes, tree stands are evil–what sport is there in hiding in a tree to kill a deer? The challenge is to get one while not up a tree. We no longer need to hunt for survival, its considered a sport, so why the tree stand? Another thing that just doesn’t make sense to me. I’m sure I’ll get some flack for that opinion. Bambi drama aside, I did manage some decent finds, which increased my detecting fever all the more. I found a really nice shoe buckle, screaming louder than a soda can, and reading 12/25 on my E-trac? (That’s a new one), a part to a 19th century lamp, a dateless silver quarter, and what appears to be part of an old pen or make-up brush, made all the more fabulous because it has “Sterling 925 1000” and a hallmark on it. I also found the obligatory spoon, (I’m still convinced our ancestors ate nothing but pudding), along with other odds and ends, shot gun shells, and whatsits. And I can’t forget to mention the oxen shoe, because as anyone who hunts with me knows, I cannot resist their signal and have a vast collection of them, which I am currently cataloging for my Oxen Shoe Museum. On my way out, I came upon a geocache. It was fairly easy to spot, located at the bottom of a tree with orange plastic tape tied and fluttering about to advertise its existence. 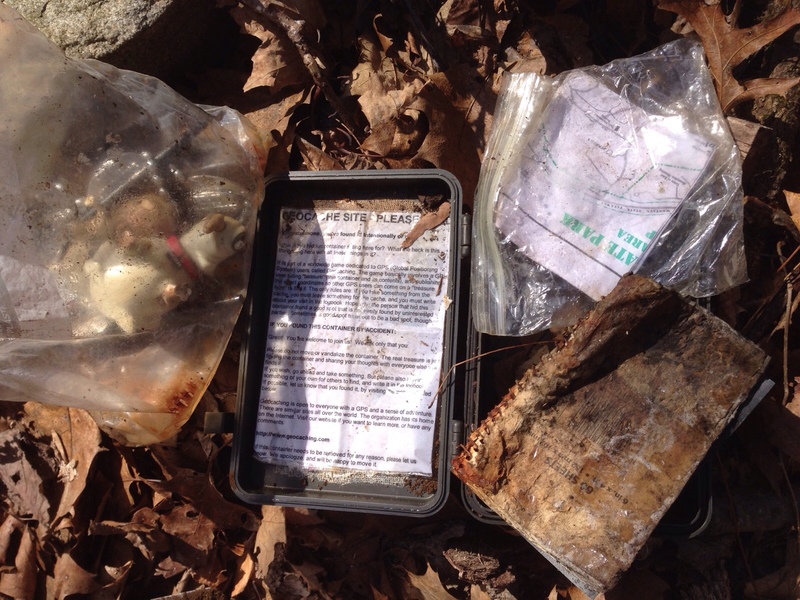 Unfortunately, the cache was a mess, out of it’s box, and its notebook water soaked and illegible. I tried to put the odd contents (doll, earrings, Men In Black Pug, etc…) back in the box, and discovered the contents did not fit, leading me to believe that was the reason it was left that way in the first place. There’s nothing worse than finding a crappy cache, so I’ve contacted geocaching.com to sort that out. 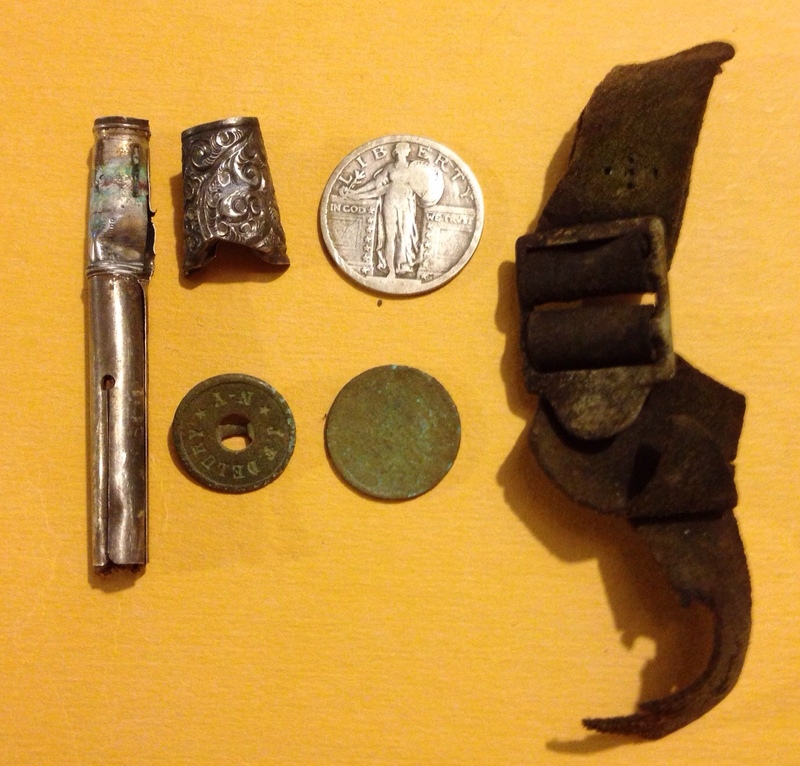 All in all, it was a successful start to the season, after my first “non-detecting” winter since I began detecting. Yes, another unbelievable statement by the Diva, and as one of my friends posted on Facebook after hearing that information, “Shame on you”, yup, shame on me. Happy Spring & Happy Hunting! Congratulations. I got out today too for a couple of hours and while I only found one silver Roosie and some clad, it felt good. We had temps near 80 this weekend but it’s only a matter of time before we will be running the AC 24/7. Hate it here. And I am in your corner with the hunting thing. Just don’t get why they call it a sport. Nothing fair about it at all. Seems like a lot of folks are finally getting out. Its been a long, cold winter round these parts. Temps near the 80’s?? I”m jealous. Funny thing, once you get back out there, the obsession returns full force. Glad to see you managed to get out and make some finds. Looking forward to your upcoming finds….it’ll be another 2 to 3 weeks in my area before I get to swing the coil….the joys of living in the great white north. I can’t say that as I get older I will be using the words “joy” and “north” together very often. The older I get the more I hate Winter, and since I started detecting, Winter has become my number one enemy! Too bad you have to wait a few weeks for the weather to break. We are still cold here, but at least the Tundra has begun to thaw a bit. Let me know what you find! Happy Hunting! Here’s a link for some of the trinkets I’ve found. Unlike Warsaw Wally we don’t stalk our members….but you have to sign in to view my so so finds………..
I’m so glad that I am not alone in finding so many spoons. I thought it was just me lol. I guess I am lucky living in Australia as it never gets cold enough (even in the middle of winter) for me to stop hunting. Winter for me essentially means that I stay out of the water when I go out and wear a jumper.